If there’s one thing PETA forgot, it’s that animals are not the only ones suffering from the meatpacking industry. 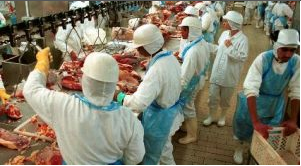 Undocumented immigrants are also victims to the dangerous conditions of slaughterhouses and the risk of deportation. So here’s some food for thought. If undocumented immigrants are risking their lives for ridiculously low wages, are they really undeserving of the benefits of citizenship? Is it not completely immoral to deport these workers just for trying to make a living while corporations get off scot-free? very informative and well written! you brought up very interesting points. it’s really tragic that organizations such as PETA freak out about animals being treated horribly in the meat-packing industry while there are people being treated inhumanely and are losing their lives. and i feel as though because of their undocumented status, they even have less voice than the animals that PETA tries to defend. There might be any number of reasons for a laptop computer to do poorly. sense to acquire a laptop having a mega sized harddrive and many gigs of ram memory.